Liverpool and Manchester United may have whisked away their aura of invincibility momentarily, but Manchester City’s 3-1 win over Tottenham Hotspur on Saturday, less than 24 hours before West Bromwich Albion unexpectedly had the final say on this season’s Premier League title, reminded us all how relentlessly dominant Pep Guardiola’s side has been this season – indiscriminate of the quality of the opposition in front of them. There’s something uniquely special about this City side. 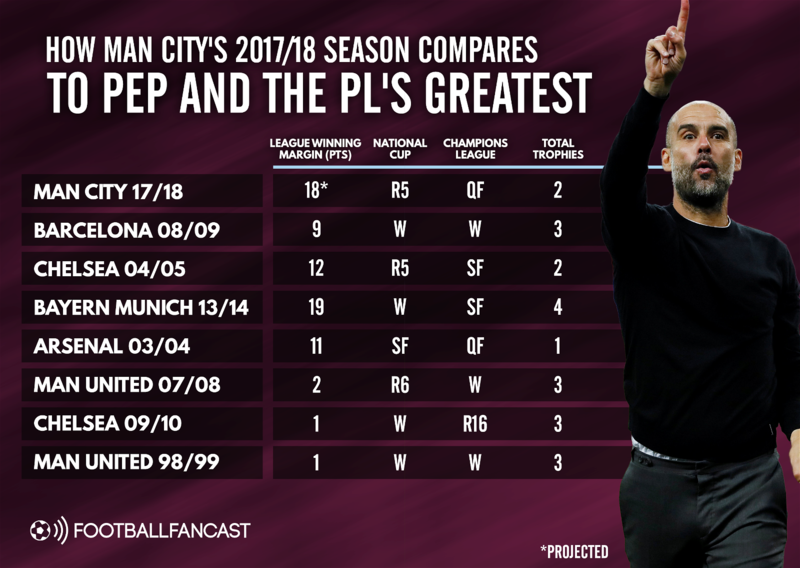 The fact they could break a succession of Premier League records before this season’s finished is evidence enough, but Guardiola has achieved something unprecedented this season. City are the first Premier League champions without that typically English powerful central core, and the first to clinch the crown without any dose of defensive pragmatism throughout the whole campaign. Even Sir Alex Ferguson was prepared to spoil important games for the sake of the right result and even Arsenal’s Invincibles drew 12 times en route to their undefeated title. Guardiola’s faith in his own philosophy though, has never waned; City either win their way, or they don’t win at all. The thing is, their way has been so brilliantly executed they’ve won all of but five of their 33 Premier League outings so far this season. This was meant to be the only top flight in Europe where that kind of idealism could never truly triumph. Perhaps then, the process of placing this City team amongst the Premier League’s greatest sides of all time is an inevitable one. After all, they’re on course to become the first Premier League team to breach the 100-point mark, to set a new record for goals scored and to average the most possession. But how exactly does this City team compare to the Premier League and Guardiola’s most formidable outfits? Are we all falling victim to recency bias, or is this team arguably the Catalan’s greatest manifestations yet? The statistics say no Premier League team can hold a candle to what City have done this season. Their closest competitor in terms of points, City’s being projected based on their averages from the campaign thus far, is Jose Mourinho’s 2004/05 Chelsea team who finished that season with 95. While Portuguese fashioned the Blues into a relentless winning machine though, a sensational achievement during his first ever season at the club, they inevitably lacked City’s aesthetic qualities – in fact, they represent the exact opposite of the spectrum, building their campaign on an exceptional defensive record (still the fewest conceded in a single Premier League season) that inevitably limited their capacity for goals. 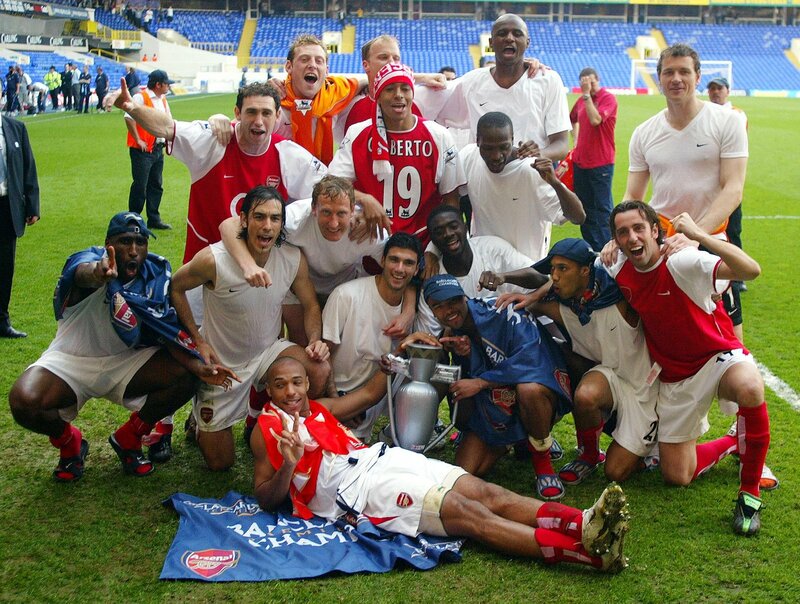 After that, the Invincibles come into play, far closer aligned to City in ideological terms yet amassing only 90 points during 2003/04. And there is a real blotch with that Gunners team, in that so many of their games finished in draws – by the end of the season, it was more a case of preservation than the bullish approach City are set to take into their final five games. Perhaps it would be different if City hadn’t lost to Liverpool in January, ending the chance of mimicking the north London outfit’s undefeated season, but it remains a point of poignant division. Manchester United, meanwhile, rank considerably lower in terms of both points and goals – but that uncovers a crucial caveat the statistics can never quite represent. City have pulled off the most dominant title win we’ve ever seen in the Premier League, but how truly competitive is England’s top flight at this moment in time? At the division’s summit, the quality and ambition is as great as it’s ever been – this is the era of the Big Six, after all – but at the same time, the gap between those top clubs and the rest of the division also feels as wide as its ever been as well. There are still exceptions to the rule – West Brom provided one at Old Trafford only last weekend – but there has been a growing trend of clubs rolling over upon visiting the Big Six and settling for damage limitation. Those games were essentially won before a ball was kicked, and even Chelsea – the reigning champions at the time – were guilty of taking that mentality to the Etihad Stadium back in March, losing 1-0 without managing a shot on target. Is that because this City side are so exceptional that even their closest rivals have been forced to accept the realities of playing them at home? Manchester United’s 3-2 comeback and Liverpool’s three wins over City this season suggests some teams could have at least posed Guardiola with a far more considerable challenge at times. And compare this season to Chelsea in 2004/05, for example. They won the title with a record number of points the year after Arsenal had lifted it undefeated, when Manchester United were just coming to the end of the absolute height of their dominance under Sir Alex Ferguson. Likewise, when United beat Chelsea to the crown in 2007/08 it was by a single point, and they turned out to be the best teams in Europe that season as well, facing each other in Moscow’s Champions League final. Furthermore, compared to a period in which English teams were consistently reaching the final stages of the Champions League, Liverpool’s run to this season’s semi-finals is a glaring exception to recent campaigns. 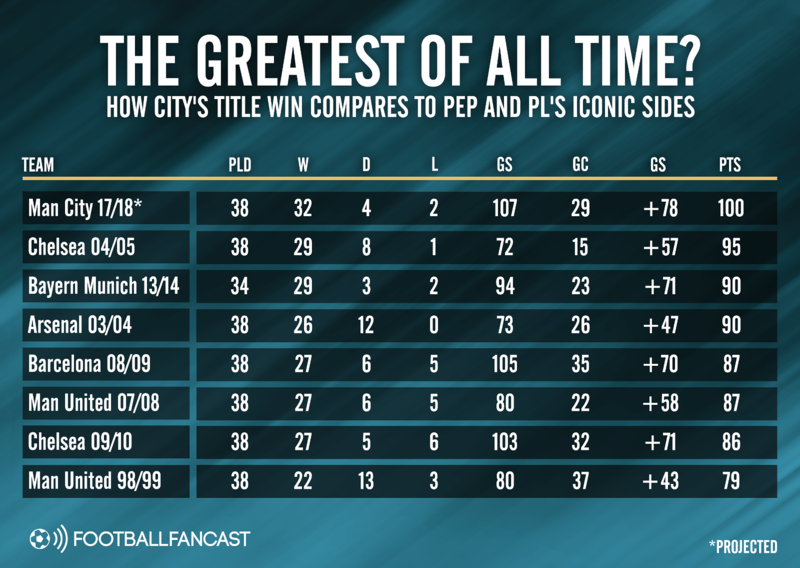 So there’s no denying that City have pulled off an impeccably dominant Premier League campaign, perhaps the greatest Premier League campaign of all time, but that’s not the same thing as being the greatest team. In addition to that absence of a true competitor, Chelsea and United particularly sustained their success over two or three years, and that’s probably where this City team falls short of Guardiola’s most iconic Bayern Munich and Barcelona sides as well. Barcelona’s 2008/09 team remains the archetype that Guardiola’s Bayern and City teams could only hope to replicate, and that’s because they were as dominant in the Champions League as City have been domestically this season. They swept away United in Rome in that season’s final, with Yaya Toure playing at centre-half, to complete a stunning treble alongside the La Liga title and the Copa del Rey. Likewise, although some of the success was in fact owed to predecessor Jupp Heynckes, Guardiola’s first season at the Allianz Arena saw Bayern win the title by a greater margin than what City are expected to achieve this season, despite their season consisting of four less games, while clinching the domestic cup, the Club World Cup and the DFB Pokal. They also reached the semi-finals of the Champions League, which they would manage during each of Guardiola’s three campaigns at the club. For all of City’s incredible dominance and relentlessness this season, they only have two trophies to show for it, one of which doesn’t actually qualify as the national cup – winning the League Cup rather than the FA Cup. That competition saw them eliminated at the hands of third-tier Wigan. Perhaps their Champions League campaign would have panned out differently had they not encountered English opposition and the only team to have previously beat them in the Premier League, but the fact remains that this City team has never exceeded the quarter-finals under Guardiola. Plenty of have matched that in recent years, with far less resources. That’s the key with judging this City side, and making sure we don’t all get a little overexcited. Yes, it’s the most dominant single Premier League campaign we’ve ever seen; but great teams are about so much more than one platform and one competition. To move onto parity with United’s treble winners, Chelsea’s ruthless winning machine under Mourinho or Guardiola’s Barcelona and Bayern Munich sides, this team still has some way to go. But next season could be the real litmus test, should City achieve something that hasn’t been managed for a decade. 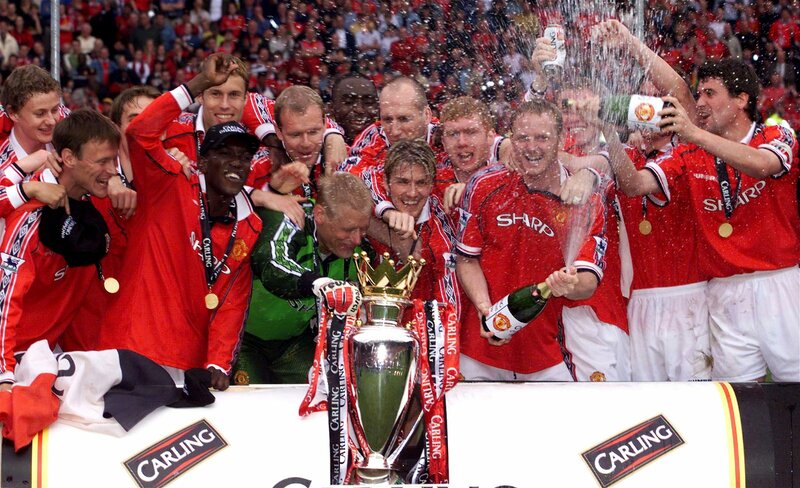 The last team to successfully defend the Premier League title was Manchester United in 2008/09; with so many talented teams at the top of the Premier League and so much incredible financial muscle, that feat is worth so much more than it was ten years ago. If City conquer that challenge, maintaining the dominance they’ve shown this season, it will be something truly special – not quite comparable with a Champions League winning treble, but nonetheless a formidable achievement in the context of modern English football.